This drawing shows the extent of the Nancefield Interchange. One year after construction started on the Musina Ring Road in the north of Limpopo, the project is scheduled to be completed within the next 18 months provided that climatic conditions prevail. 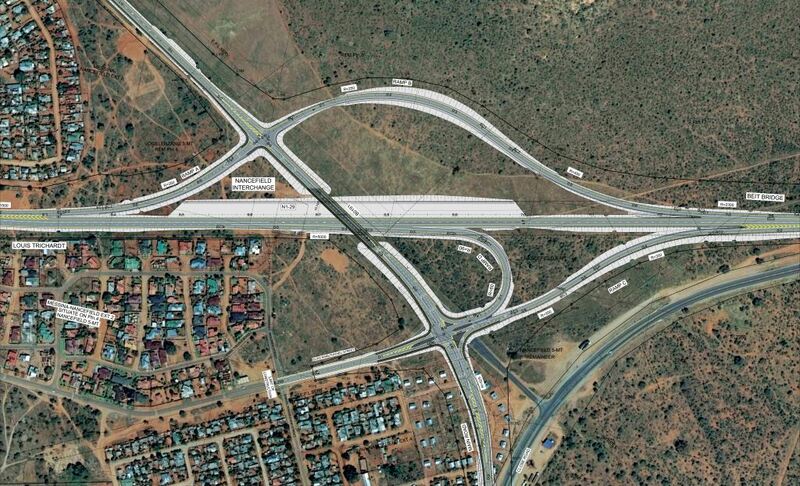 The R625-million project by SANRAL will divert traffic from the Beit Bridge Border away from Musina CBD and result in major improvements in road safety and less damage to vital infrastructure within the town. Resident engineer, Ben Botes, says trucks travelling to and from Beit Bridge are causing major damage to the road infrastructure in the town. Traffic is heavily congested as the heavy-duty vehicles have to share the narrow roads with other road users and pedestrians. Heavy traffic passing through the Musina CBD poses dangers to pedestrians and the local business community have raised concerns about access to their premises. “The Ring Road will ease congestion and reduce the dust blown up by traffic which creates health problems among residents, it will also save travel time to the road users and reduce vehicle operating costs” says Botes. An artist’s impression of the Nancefield Bridge. The project is benefitting the region through job creation and business opportunities, especially for local residents. The project includes the building of nine big structures, five bridges and four in-situ culverts. Local sub-contractors are involved in the construction of these structures. SANRAL is committed to create equitable access for small contractors, particularly black-owned enterprises through its procurement processes. The 8km project runs through the Nancefield community which necessitated the relocation of 30 households. SANRAL sent a consultant to each household to negotiate the relocations. “It was agreed that they will receive the same size structure they had in Nancefield. The community is happy with this arrangement and are looking forward to the move,” says Petrus Mbedzi, project liaison officer. Botes says the project also consists of a barrier wall that will minimise noise levels for the households living next to the road.